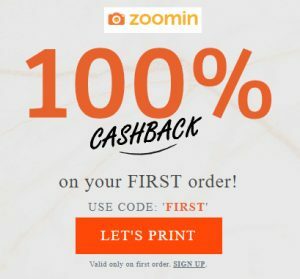 now use the promo code and Get 100% Cashback on Customized Prints at Zoomin.com today! Order your favourite Photo Goodies now and get 100% Zoomin Cashback on your first order. Use code ‘FIRST’ during checkout to avail discount. Every reward Point you earn is worth ₹1 off your next purchase on Zoomin. So go ahead and capture your latest adventures and celebrate your best moments in our Photo Products.